Escoda Opera Takatsu is a synthetic filament that has a feel that is almost identical to traditional sable, but much more robust. The extra natural spring and resilience of the blended filaments makes it an excellent choice for acrylics and oils. The Escoda curing process creates a brush head that consistently snaps back to its original shape. 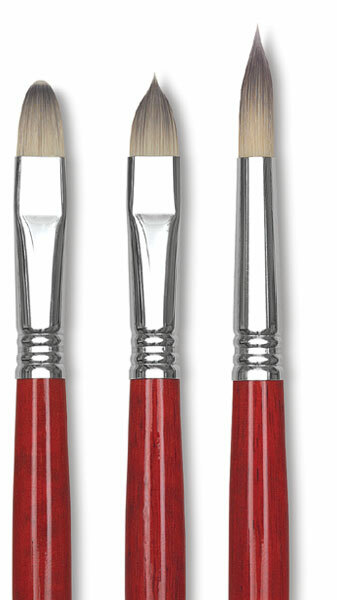 The long, red-lacquered wood handle is triple crimped to the nickel-plated brass ferrule. 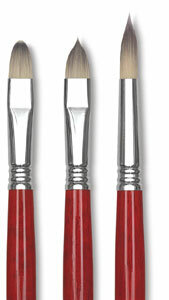 Filbert, Series 3060 — A "cat's tongue" profile is characteristic of the tip of this Spanish style filbert, allowing for both the traditional filbert brush stroke and finer, more detailed work.